I took the liberty of adding mushrooms, more carrots and for the second serving, I made single serving beef pot pies with mushrooms, onions, potatoes, and a puff pastry crust, perfect comfort food indeed. 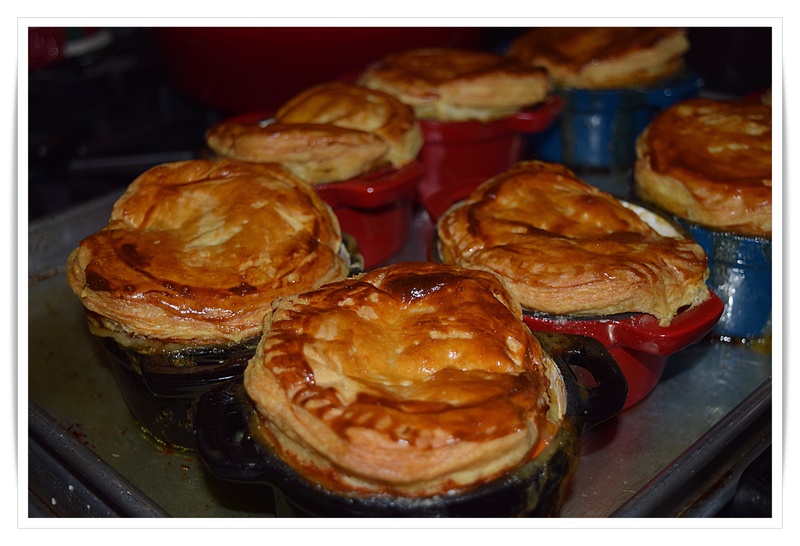 There are plenty of short rib pot pies unless of course you already have a favorite one, just be sure to reserve some of the pot gravy and consider making more if you intend to do the pot pies…I cheated of course since pie crust making is not my favorite sport, they come out fabulous every time. Ruth’s recipe is below and while it calls for bone-in beef short ribs, I prefer the meatier boneless when available, but if you have access to meatier bone-in ribs you will have a lovely deeper flavor and some bone marrow to boot. 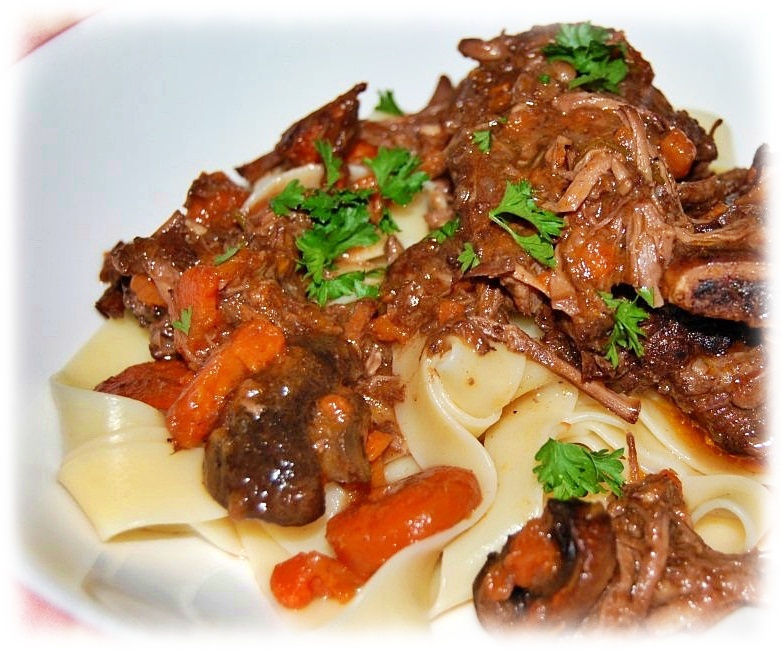 Pour the red wine over the short ribs and let them luxuriate together overnight in the refrigerator. In the morning, pour the wine into another bowl and pat the ribs dry. Dredge the ribs in a mixture of flour, salt, and pepper, then pour a good glug of olive oil into a large casserole and brown the ribs in batches, removing each one from the pot when it looks deliciously crisp. Add the onion, carrots, celery, and garlic to the pot and cook them for about 15 minutes, watching as the vegetables become soft and fragrant. Return the ribs to the pot; toss in a sprig of thyme, the chicken stock, and the reserved wine. Bring to a boil, cover, and put into a 350-degree oven for an hour and a half. Turn the meat and cook for another 45 minutes. By now you should be able to wriggle the bones out. Do that, throw the meat back into the pot, remove the sprig of thyme, allow the stew to cool, cover, and refrigerate overnight. The next day, remove the hard layer of fat that has floated to the surface of the pot and reheat the ribs and the sauce. Remove the ribs and boil the sauce down to about 2 cups. Stir in the tomato paste, taste for seasoning, and serve. It’s not a lot of meat, but it’s extremely satisfying on a pile of mashed potatoes…or egg noodles. Reichl, Ruth. My Kitchen Year: 136 Recipes That Saved My Life. Random House Publishing Group. Kindle Edition. * Optional for addition gravy if you need it, 1 packet of au jus gravy/ makes about three cups, but you won’t use it all, just enough to supplement the already pot gravy if need be. For 4 pot pies, I used 1 sheet of puff pastry, thawed according to instructions, and cut into circles to cover the meat pies. store in the refrigerator until ready to make the pies, on a piece of parchment paper and wrapped in plastic. Make ahead. Since we are only two I had enough short ribs (about 1 pound)and sauce to make little pot pies…Cut the remaining short ribs 1/2 and cut into about 1/2-3/4 inch cubes and add the cubes to the remaining pot sauce. I didn’t measure the rest of the ingredients, about 6 good-sized mushrooms, sliced, 1 carrot, peeled and small diced, 8 baby potatoes quartered (again about an inch) about a cup of frozen pearl onions, some frozen peas, and pinches of some freshly chopped, parsley, thyme, and about 1/4 teaspoon fresh chopped rosemary. Add the potatoes to a large measuring cup of water and microwave for 5 or so minutes to soften, drain and reserve, then soften the carrots and drain. In a large sauté pan sauté the mushroom in a bit of oil and the frozen onions and continue stirring and cooking until you see a bit of brown on the onions, toss in the drained potatoes, again get a bit of a brown tinge on the cubes. Season with fresh herbs and add the pan gravy and some of the au jus. Thoroughly heat, butter your individual pot pie ramekins using a slotted spoon the filling add filling, add the gravy to each ramekin, being careful not to overfill, top with pastry, and brush with a little heavy cream.